Why do our stylists average 15 years of employment with Grondin's Hair Centers? It's because we're a family-owned company that has designed a great environment for our employees and our customers. We hire talented, creative stylists so our customers always receive the quality and attention they deserve, and we find ways to keep the costs of our services affordable to everyone - which creates unlimited earning potential for our employees. Why choose a career at Grondin's? First things first.... with a guaranteed hourly wage and a steady line of walk-in traffic, you'll make money immediately. Rest assured though, that's where it starts for our stylists - not where it ends. We help you stay up-to-date on the latest hair styles, techniques and trends; you'll become knowledgeable in the best hair products on the market; you'll meet a ton of new people; and you'll be working in a fun and exciting salon with the most talented stylists in Michigan. In so many ways.... but one the most significant ways is the diversity of our stylists. Over time, each stylist often finds a specialty, their niche. The part of the job they absolutely love. Yours might be finding that creative simplicity. Maybe it's delivering cutting-edge color. It's could be men's haircuts or creating beautiful, trendy hairstyles for women. You might even be one of the special few that loves doing it all. Whatever your passion, we find creative ways to promote you and your services to the community, and then help nurture the relationships you establish to build your profitable book of business. Remember, we don't succeed if you don't succeed. Our stylists are offered an hourly wage with service-level increases. Our employees are offered group-discounted Health Insurance, Dental Insurance and Vision Insurance. Aflac Insurance is also available. Grondin's Hair Centers carry a wide range of products for our customers - including the "Grondin's Originals" line of products. We offer our stylists training and product discounts to become experts with our products, and then we offer incentives and bonuses for merchandise sales. Our full-time and part-time stylists are offered paid vacation after their first complete year of service. You'll get all the details in your interview. Stylists are given merchandise discounts to encourage usage and experimentation. Having a personal experience with a product will help you when recommending products to customers. Hair trends and products are constantly changing. We make sure our stylists have every opportunity to stay on top of that change. During your first 6 months of employment, the salon manager will introduce you to the processes we've established and the standards we expect from our stylists. We'll make sure your training is up-to-date and we'll help you become familiar with the line of retail products we carry. Interested in a career in the Cosmetology Industry? 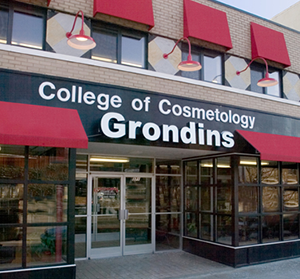 Grondin's College of Cosmetology offers courses in exciting careers with limitless opportunities. If you're interested in learning the art of cutting, styling and coloring hair, or becoming a nail technician, the courses at the College of Cosmetology are for you.